Since the first version of this site went online in 2006, I have received frequent enquiries via the contact form about the origins and history of the name Enticknap, either from other Enticknaps themselves or people who knew them. The following article is based on genealogical and other research carried out by members of my family, in the hope that that it will answer your questions on the subject preemptively. If it doesn’t, please feel free to comment or contact. The name in its current form has its origins in a very small patch of south-eastern England, centered around the village of Dunsfold, near the border between the counties of Surrey and West Sussex. An area of woodland within the parish of Dunsfold called Enticknap’s Copse can be visited today. This area is now effectively an outer suburb of London, sometimes nicknamed the “Surrey Stockbroker Belt” in reference to its pretty rural scenery and the high cost of living there. Within about a 15-mile radius of Dunsfold, you are probably in the only part of the world where having the name Enticknap is not at all unusual, and you will not be asked to spell it! Enticknap’s Copse, near Dunsfold, Surrey, United Kingdom. It is located at 51° 7′ 42.6″ N 0° 34′ 31.57″ W, or SU997375 on the British National Grid. Dunsfold and its environs was a very different place when the first Enticknaps arrived on the scene. It was an entirely rural, agrarian society, and if anyone did travel beyond the next village, it was usually to Godalming or Guildford, and very rarely as far as London. The earliest written evidence of any Enticknaps is in property deeds surviving from the thirteenth century. The name in those days was de Anekecneppe – literally, “of Anecke’s hillock”. 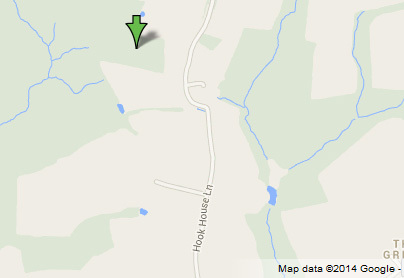 This place name has not survived: it must have been in Hambledon, a parish lying just to the north-west of Dunsfold. De Anekecnappe was at this stage not a surname in the modern sense, passed on from parent to child and identifying a given family, but an indication of where the bearer held property. If the property owner moved out, their name changed; if another moved in, they adopted the name. So the persons named in these early deeds are not the ancestors of today’s Enticknaps. I believe the first “real” Enticknap was the Thomas de Anteknappe of Hambledon, who paid tax in 1332. He was reputedly not born an Enticknap, but was probably the ancestor of later Enticknaps, as it was around the mid-14th century that surnames became hereditary. This Thomas was the only Enticknap taxpayer in the whole of Surrey at this time. The tax he paid was minimal; he was only just wealthy enough to have to pay it, and if there were any other Enticknaps living in the same area at this time, they fell below the threshold of liability. So the Enticknaps were at the lowest level of the property-owning class in the early 14th century. Although the name originated in Hambledon, the richest Enticknaps in historical times lived in the parish of Chiddingfold, in a hamlet called Pockford (which is close to the parish boundaries of both Hambledon and Dunsfold). Enticknaps are first found in Chiddingfold just after the middle of the 14th century (by this time the surname had become hereditary, so it survived the migration from Hambledon, and the “de” prefix disappeared). The acquisition of the Pockford estate came several generations later, in the third quarter of the 15th century. During the period from 1332 to the 1470s the Enticknaps had prospered, grown wealthier and established themselves as yeoman farmers who mixed with the highest ranks of society. One of them, a John Enticknap, who I believe may have been the son of the first Enticknap yeoman of Pockford, became a servant in the household of the heir to the throne, Prince Arthur, shortly afterwards (in 1491), and subsequently became Janitor of the Castle of Flint, a royal appointment. The name was still usually spelled with an “A” as the first letter; “E” gradually supplanting “A” from the beginning of the 16th century. Although Enticknap is the most common spelling of the name today, it is not the only one: there are a few Entiknaps and Enticknapps. The name is pronounced exactly as it is spelt, with a slight emphasis on the first syllable. There are two attractive myths about the early days of the Enticknaps; regrettably there is not a shred of evidence to support either. The first is that Enticknaps fought on the losing side on the Norman Conquest. It is possible that people from the place called Anekecnappe did fight there, but there is no record anywhere that they did. And if they did, they would not have been the ancestors of today’s Enticknaps. The second is that Alfred the Great granted a charter to the Enticknaps of Pockford. This is certainly untrue. As stated above, the Enticknaps did not acquire their Pockford estate till the 15th century, six centuries after Alfred reigned. In any event, the modern surname system had not developed in Alfred’s time; virtually every Saxon listed in the Domesday Book had just a single name. So this myth contains not one but two anachronisms to rival Shakespeare’s clock in Julius Caesar’s Rome. This myth was always extremely implausible and it is surprising that it has gained the currency it has. The charter is said to have been in the Sadler Collection (of documents accumulated by the Pockford family – this collection is now held by the Surrey History Centre). It isn’t there now – why not? Surely such an important document would have been treasured with or even more than the rest? Also, it is unbelievable that King Alfred would take time off from fighting the Vikings to assign a relatively small and unimportant property to a relatively unimportant family in Chiddingfold, a location so unimportant it does not even feature in Domesday. St. Mary’s Church, Chiddingfold, where many generations of Enticknaps are buried. Photo © Nicholas Enticknap, 1982, used here with permission. The Roundhurst branch became noted blacksmiths. Between 1813 and 1950, census records reveal Enticknap blacksmiths to have worked in at least 28 towns and villages in the south east of England, most of them in Surrey and Sussex. Roundhurst Forge, West Sussex, where Enticknap blacksmiths worked between the late 1780s and 1950. Although disused when this photo was taken in 1980, the bellows still worked. It is located at 51°3’47.43″N 0°40’40.138″W, or SU927301 on the British National Grid. Please note that this building is now a private residence (the forge itself has since been converted into an apartment) and cannot be visited by members of the public. Photo © Nicholas Enticknap, 1980, used here with permission. The Enticknaps have been a remarkably local tribe for most of their history, and did not start to move away from their ancestral stomping ground in significant numbers until the early twentieth century. 166 Enticknaps are listed in the 1851 census, and have all been traced back to nine common ancestors. Eleven Enticknaps were killed in action during World War I, all of them from the south-east of England. Today, we estimate that there are currently around 700 Enticknaps living in the UK and another 100 or so expats. Put another way, there is approximately one Enticknap for every 71,000 of the population of England and Wales. Enticknaps are to be found worldwide: we have evidence of them living in France, Germany, Hong Kong, Ireland, Kenya, New Zealand, The Philippines, Romania, Singapore, Thailand and Vietnam. I am, to my knowledge, one of about twenty American Enticknaps. There is an Enticknap Park in Leeton, New South Wales, Australia, which I’m guessing (please comment or contact if you can confirm or refute this) is named after George Enticknap (1894-1976), Minster of Transport in the New South Wales legislature from 1956-60 – probably the most senior political office that any Enticknap has been elected to, and the only Enticknap so far to have become famous enough to have a Wikipedia page! He was the grandson of Ambrose Enticknap (1830-88), who was born in Godalming and emigrated to work in the gold fields of Victoria around 1855. High profile Enticknaps alive today include Tyler, a Motocross racer, and Rupert, an opera singer. Photo © Wikimedia user “Bidgee“, 2008 – used here with permission under Creative Commons 3.0 license. But despite having made it to the other side of the world, the name remains closely linked to the region of its ancestral origins. Google “Enticknap” today, and a large proportion of the individuals and businesses that will appear are still based within a short distance of Dunsfold. Please feel free to comment on this page below, or to contact me if you have any comments or queries. My father has one or the other on his wall, though I’m not sure of the difference, either, or how that one came to be created. Your story must be a very rare example of an Enticknap who was born about as far as it’s possible to go from Enticknap country, and then immigrated back there! I did the opposite (born and brought up in Wimbledon, about 35 miles from Dunsfold, and emigrated to California), as did many of us since the tail end of the Industrial Revolution. SARAH ENTICKNAP, Bapt. 16 Feb. 1747/8 at Dunsfold, Surrey – recorded in the baptismal register as “Sarah the daughter of John Enticknap”. M 13 March 1769 at Fernhurst, EDWARD BERRY, of Fernhurst, Sussex (Bapt. 21 July 1743 at Fernhurst. He was recorded as “Ewd [sic] Berry, Senr [sic]” in the list of ‘The Number of the Peoppl [sic] of the Parish of Fernhurst March 29th 1815’ compiled by Rev. John Henry Spelman Cary. Died after 1815). Bur. 14 Jan. 1820 at Fernhurst. She appears to have been the daughter of the John Enticknap who married Sarah Dawtrey at Dunsfold on 1 March 1738/9. At their marriage John Enticknap & his wife were recorded in the Dunsfold marriage register as “John Enticknap of Chiddingfold & Sarah Dawtry”. I wonder if you can place this Sarah amongst the Enticknap family tree that you have researched? Hello again Nicholas and greetings Leo. Jean Enticknap from Seattle here, checking in after several years and an email change. Grandfather Herbert, Father Edward (Ted) Enticknap who passed away August 1, 2009. Can’t remember how far we got in filling in our branch of the family tree, but feel free to contact me at my email address should you want filling in. I am Facebook friend with Jean Enticknap who lives in Leigh-on-Sea, from Southend-on-Sea…we are 6 month apart in age! Her brother Tony says they are from Chiddingfold Surrey. Freaks some of my friends when Jean Enticknap reponds to Jean Enticknap. Thank you Leo for posting the photos and information. Would love permission to use the Enticknap Park photo for my facebook cover page for fun! Do you know how I can obtain it, please? It’s published on Wikimedia under a Creative Commons license, meaning that as long as you credit the original author (see link above), you’re welcome to re-use it. By the way, apologies for the delay in processing your post and the others above. My Grandfather was Richard Enticknap originally from London (don’t know which part) then moved to Liverpool after the war, he was in the Kings regiment. He was married to Florence (Barbara) and they had four girls. All four girls were married so our name pool ended when he past away in 1980. Your site is incredibly interesting – Thank you. My Grandmother was Patricia Enticknap (Born in 1925) in the Guildford area. Her father was an Edward J Enticknap who had married an Irish Lass (Frances Finch) in Kingston. Edward J’s father was an Edward T Enticknap (born in 1870- I think) he married Emma Mary. I know little else but my Auntie Sue (Patricia’s Daughter) still lives in Guildford. My paternal gt. aunt AMY PARR married ELI ENTICKNAP June 16, 1906 at Rogate, West Sussex. Eli was born abt. 1881 Wisborough Green. The 1911 Census they are living at Strood Green, Wisborough Green with two children Percy and Ruby. Eli is a Blacksmith. I love this article. I did my own research a few years ago, but I never got anywhere to tracing the name’s origins as you have. I can’t remember what I discovered, though, other than that my great grandmother’s maiden name was Granados; my grandfather, Charles F Enticknap, was born in Midhurst in 1920; and he had six siblings, I think. Your grandfather was a contemporary of mine (John Brandon Enticknap, 1922-2012, born in Woking). Must ask Dad if we’re from the same branch of the family. I don’t think Grandpa had as many as six siblings: there was certainly one (David). Apologies to the authors of the bunch of comments I’ve only just approved, some of which go back nearly two years. The pressures of work and a baby son have prevented me from even touching this site during that time, and I’ve only just had time to sift the genuine comments from the spam. I will ask my father, Nicholas (who is the family history expert), to have a look at today’s additions, and for his thoughts on them. Would it possibly be connected to the tenant farming Enticknaps of Kirdford Sussex? There is not enough information here to tell us anything other than that a Mrs ENTICKNAP was in 1912 a tenant farmer, of which there were a number at the time in both Surrey and Sussex. I would guess that virtually all of them owned pigs. I have a birth record for you and your siblings. I know also of your grandparents, but have records of only 11 of their children, so I think the three missing ones – John, Mark and Irene – may have been born abroad. If so, I guess John senior served in the forces. I have found no birth record for John senior, so cannot trace this family any further back than that – possibly he was born abroad too. My family line were farmers who lived at Pear Tree Green near Dunsfold in 19th Century, our family tradition was that it was a Viking name. Your great-great-grandparents James & Harriet ENTICKNAP were living at Pear Tree Green when the 1871 and 1881 censuses were taken. Notwithstanding the family tradition, ENTICKNAP was not a Viking name. Our name originates in south-west Surrey, which was never settled by Vikings. Minnie was born in 1900 in Woolbeding in what is now West Sussex, the seventh of 12 children of John & Edith ENTICKNAP of the North Ambersham branch. (So if Horace really was born c1870 he was MUCH older than his wife!) Minnie died in 1963. Our grandmother was Minnie Enticknape she was born approximately the end of the eighteen hundreds ,she married our grandfather Horace Stanbridge who was born in Holmwood in about 1870 ish can you help? My maiden name was Enticknap and I am descended from the Dunsfold branch of the Enticknaps, my Great-great grandfather being John Enticknap born 1812 who married Sarah Booker in 1835. I see you mention that there were three nuclear families in 1700 and I am wondering which they were and to which of these families the Dunsfold branch stems. Incidentally I have been resident in Australia for almost thirty years now and would be very surprised if Enticknap Park was not named after George. You may know he had osteomyelitis as a child and his leg was amputated above the knee. Of the three nuclear families only one (as far as I know) survives to this day, the Pockford branch. I am unable to trace the Dunsfold branch back as far as this. I did know about George the politician’s loss of a leg in childhood, and also two other pieces of misfortune; his first wife died a couple of years after their marriage, and his only child was stillborn. I cannot identify you without more biographical detail, so I cannot say which if any WW1 casualties you are related to. Interesting read Leo! My family lives not far either in Basingstoke. Amazing that the majority of us haven’t gone far at all! I only have records of three Adam ENTICKNAPs, two of whom were born in California and therefore are neighbours of Leo’s! You therefore are presumably the remaining one, who was born in the Basingstoke area. If so, you are a member of the Dunsfold branch, and also, incidentally, the nephew of Sally OATES above! This is such a fascinating site. I am yet another one with a connection to the Dunsfold Enticknaps, although I am confused as to exactly which one! My mother’s maiden name was Enticknap and she was born on the coast near Brighton, as were both my Grandfather, Albert and his father Isaac. However Isaac’s father, William Enticknap was born in Dunsfold apparently around 1835. (William’s marriage to Eliza Kilner in 1864 in Brighton gives his age as 29, his profession as Baker and his father, also William, a Carrier). William of Dunsfold seems to have died in Brighton in the 1870’s. I have been trying to find out who the parents of “my” Dunsfold William are so that I can go further back but there are too many possibilities to be exactly sure. I would love to know more! This is a problem I am familiar with; I had to tackle it myself when I was sorting out the relationships between the 19th century Enticknaps. It was caused by William lying about his age: far from being 29 when he married, he was only 21! I assume he adopted this fiction because he was very much younger than his wife. He died in 1871, just after the census of that year, and his wife told the registrar his age was 36, so William clearly kept his true age secret from her to the end. William was born and baptised in 1842 in Dunsfold, the youngest of five children of William & Harriet ENTICKNAP, who married in 1827. William senior was baptised 1806 in Dunsfold; the parish register gives his parents’ names as John & Harriet, but this is a clerical error; it should read John & Charlotte, who married the year before. John was baptised in 1784 in Dunsfold, the son of John & Mary, and this is as far back as I can certainly go. I think it likely that John senior was baptised in 1753 in Hascombe, the son of James & Betty. James’s origin is uncertain; he may have been baptised in 1713 in Chiddingfold, the son of John & Ann. I have no possible baptism record for this John – he must have been alive in 1700, but was not a member of one of the three families known then. Incidentally, all of this genealogy from 1784 backwards is relevant to the query posed by Gill above. Edward Arthur James Enticknap (b 1887 d 1950 watching cricket) was the last blacksmith at Roundhurst. Edward did not marry. He was my father’s (William Herbert) brother. Edward had two further brothers; Alfred Frederick and Thomas Henry and three sisters; Edith Lucy, Harriette Augusta and Alice Eliza. Alfred married but did not have children. Thomas married and had three sons and one daughter. None of Thomas’ sons had children. I am the only male line from Edward. Edward [snr] ‘s father was Henry (b Lurgashall 1830). Henry was a blacksmith in Haslemere by 1851, in Petworth by 1854 and Roundhurst by 1861 to join his brother William who was at Roundhurst by 1852. Henry and William had twelve other siblings. Their fertile parents were William (b 1788 d 1851-61) and Elizabeth Tregood or Tregoose. William’s parents were Charles (b 1744?) and Mary Lucas ? That is a far as I can go back. Mention has been made of Agincourt. I have a photocopy of an article from the Sunday Express (undated, but I guess 1939/40) about the men of Dunsfold; the Enticknaps, Puttocks, Bowbricks, Bromhams, Hooks, Mitchells and Smithers being bowmen at Agincourt. 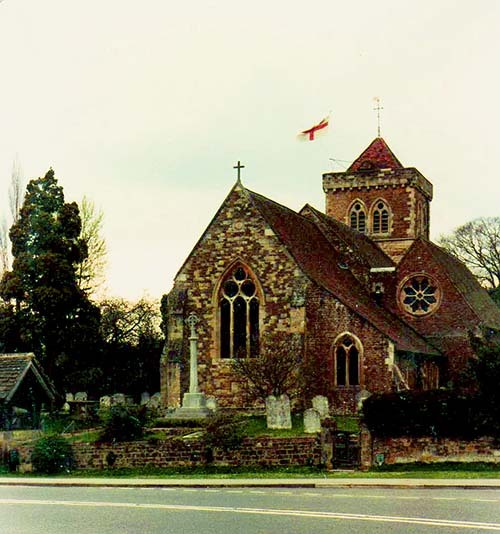 Chiddingfold Church has a record that states that the Enticknaps (de Ende Knappe) of Pockford were granted their land by charter from King Alfred the Great (King from 871 to 899). What the Enticknaps did or were expected to do to receive this royal gift is not stated. A “heat” link has been suggested between glass making and blacksmithing. There is an intermediate link, iron working. The National Trust guide to lands near Hazlemere states that Blackdown is rich in ironstone and had iron works at Imbhams, Shillinglee Park, Nothchapel, Fernhurst and Hammer. It goes on to say that when the iron works died out the Enticknap family moved to Roundhurst. In the 1500’s, on the farm now called Lower Roudhurst, was a small factory making glass. The site is now a field called Glasshouse Piece. This little factory may have been an offshoot of one of the eleven Chiddingfold glassworks that operated during the reign of Elizabeth 1 (1558 to 1603). The factory at Dyer’s Cross, Chiddingfold was on land granted by Simon de Stokas in 1226 to Laurence Vitrearius (“Larry the glassmaker” – from Normandy). It continued until 1301 by his family, William le Verrir and Richard de Dunkhurst. Around 1340 the glassworking Schurturre family arrived in Chiddingford from Normandy. They were followed by the Peytowe (Peto or Poitou) family, also from Normandy. No mention of De Anekecnappe, but was this Jean’s family name? The prefix “De” means “from” or “of” region of origin, so he may have been Jean from Anekecnappe. Anekecnappe is phonetically similar to Andernach, a town in Germany that had many Jewish glassworkers who were periodically persecuted in the 14th century, many fleeing to England, probably via Normandy. I have heard this story that Edward Arthur James died watching cricket before. There is an alternative story recorded at the time of his death in the Sussex County Magazine that he died “in the very act of shoeing a farmer’s horse”. Both traditions cannot be right! This genealogy is incorrect, though understandably so. The confusion arises because William (bap 1789, d 1851) married twice and chose an Elizabeth both times. His first wife, Elizabeth TREGOOOSE (bap 1786), bore him three children before she died in 1815. William then married again, this time to Elizabeth DENYER, and to confuse subsequent historians still further he did it in Dunsfold. Both William & Elizabeth declared they were residents of Dunsfold at the time, which is mysterious as neither is found in that parish at any other time; William lived in Lurgashall all his life, while Elizabeth was born in Chiddingfold and then moved with her parents to Haslemere as a small child. This marriage produced 13 children, including Henry (your ancestor) and William junior (my and your ancestor). William senior was indeed extremely fertile, siring 16 children in all, while Elizabeth nee DENYER gave birth to 13 within less than 23 years, so must have been pregnant for virtually half of her child-bearing years! William senior was the son of Charles (bap 1748, d 1819) and Mary nee LUCAS (bap 1744, d 1819), who married in Fernhurst in 1774. Charles’s baptism was in Dunsfold, and his father was Thomas, presumably the man buried there in 1766. I can speculatively trace our ancestry back from Thomas till it joins up with the Pockford branch, but without any proof. I believe (but without documentary proof) that Charles practised as a blacksmith in Fernhurst from his arrival there until the late 1780s, when he moved to Roundhurst. Whether he was an iron worker before that I do not know. Charles is the first known Enticknap blacksmith. I do not know his father Thomas’s occupation, but guess he was a small-scale farmer. Charles may have turned to blacksmithing aged 19 when his father died; if Thomas was a small-scale farmer there is no evidence of his farm surviving in Enticknap hands, and Charles would have had to do something to earn his living. I have not found any documents describing Enticknap archers at Agincourt, but find this suggestion plausible, as there are Enticknap archers found in muster lists a century and a half later. I have found no evidence at all to suggest Enticknaps were glass makers, and with some regret do not believe they were. All of the glassmaker names David mentions (plus others such as John ALEMAYN) are found in the collection of property deeds left by the Enticknaps of Pockford (now stored at the Surrey History Centre under the name “Sadler Collection”), but I have found no suggestion there of any Enticknap involvement in this craft. I know this family, but cannot help you with your ancestry, as I do not know Ruth’s husband’s name either. I would recommend ordering a copy of your father’s birth certificate, which will provide this information. Hello Leo. I happened on your website by chance, but it caught my eye as Enticknap is not a common surname – unless, of course, you come from Dunsfold, where I was born! My mother and her sisters had a very good school friend at Dunsfold named Beatrice Enticknap: her father Ned had a farm near Pear Tree Green, about half a mile along Hookhouse Lane from our then family home at Church Green. I do have a distant family connection: one of my mother’s great-grand uncles, Edward Heather, married an Ann Enticknap, about whom I know little except that her parents were John & Hannah who were living at nearby Bramley in 1841. Doubtless you have them somewhere in your family database ! I know all the people mentioned. Beatrice was b 1925, d 2008, daughter of Edwin (1889-1964) & Mary ENTICKNAP of the Dunsfold branch. Edwin was the son of George & Ellen ENTICKNAP and is shown living with them at Pear Tree Green in the censuses of 1891 (aged 2) and 1901. George (1845-1928) was the son of the John (bap 1812, d 1878) & Sarah ENTICKNAP referred to in the posting of Gill above. John was the son of another John (bap 1784, d 1848) and Charlotte; John senior was probably bap 1753, the son of James & Betty. Ann ENTICKNAP was bap 1824 Bramley, daughter of John & Hannah, and m Edward HEATHER in 1845. John was bap 1794 Hascombe, son of William & Ann. The ancestry of William is uncertain; he was possibly bap 1755 Hascombe the son of James. This is the same James who was the father of John (bap 1753) above. If all these assumptions are correct, the Beatrice your mother knew was related to the Ann, who married his mother’s great-uncle! my great great grandmother was Mary Enticknap, who married Henry Wellen in 1863. Her father was William Enticknap, christened in 1800 and her mother was Hariot Mills, christened in 1814. William’s father was John Enticknap who married Sarah Carpenter in 1799. They all came from Lurgashall/Fernhurst area. Mary’s daughter Ellen married Frederick Tickner and their daughter Ellen Amelia was my grandmother. My grandmother’s brother lived in Woking, so as you say, still all firmly linked to that geographical area. A correction: according to my notes Mary ENTICKNAP m Henry WELLAND (the spelling of this name varies almost as much as the spelling of ours) on 3 June 1861 (not 1863) at Fernhurst. I can take Sarah’s tree back one further generation: the John who m Sarah CARPENTER was the son of George ENTICKNAP (b c1742, d 1827) and Martha nee GOODYEAR (b c1748, d 1827), who married on 27 February 1775 at Haslemere. I have read what the experts say about the origin of our family name and wish to put another slant on it. Dunsfold and the surrounding area was the first place in the UK where glass was made. Those that brought this technology were Jewish immigrants who escaped persecution in Alsace. The jews had been blamed for bring the plague into France. On a visit to Germany many years ago I found out a totally different interpretation of our name. The original ancestor was John de Anecknappe. In old german I was told (Knappe) meant a squire (an apprentice knight). So if we break down the name John (apprentice) to a knight called Anec. When I look at my family visual resemblance there is no mistake we have jewish roots. The name was changed to hide the origins and integrate. Another process of integration was conversion to Christianity. In the church of Chiddingfold there are certain symbols which are certainly not Christian and lead more to jewish influence. Another connection with glass making is the fact that a piece of land is called Enticknaps Copse. Coppicing was an old method of managing wood on a sustainable basis. The wood used for the fuel in making the glass. If you look into the origins of glass making Dunsfold was key. It is interesting to compare the topography of the area of Dunsfold and areas in Alsace where also glass was made. I just wish I could positively make the connection but somewhere in the DNA it all fits. I think the Jewish roots are more likely to have come from a female line than from any ENTICKNAP: I have no record at all of any Jewish ENTICKNAPs. Genealogy is my hobby and I have been researching my best friend’s family tree. I plan to give her the results in a book form as a gift for her birthday in December. I discovered she has an Enticknap in her tree and being such an unusual name I looked it up and came across your site. As there are so few of you in the world I would be interested to work out how you and Tracy (my friend) are related. Her ancester is Ann Enticknap (1749-1831) born, raised and died in Chiddingford. She married Benjamin Nash in 1780. Do you have any info on the family of that time that I could use to bring her ancestors to life a bit more for her. I have tried where possible to include details of the era, occupations and as much detail as I have been able to find about her family so far but talking to relatives (however distant!) has helped me when researching. I discovered another friend’s distant cousin in Canada and they now chat on Facebook regularly and I found a half-brother and half-sister my husband never knew he had! I’m investigating – watch this space. Once upon a time there was a yeoman farmer called Thomas ENTICKNAP. There were actually over the years quite a lot of them, most of whom feature in this story, so we’ll call him Thomas I. Birthdate not recorded, but my guess is c1588; d 1636. He was the prominent Enticknap of the day, owning and running a farm called Pockford in the north-east of Chiddingfold which his ancestors had been managing for over a century before he was born and his descendants continued to manage for two more centuries after his death. Thomas I had quite a lot of children, including several sons. The eldest, John, inherited Pockford (and I believe went on to become the nearest common ancestor of ourselves and Liz Wood’s friend Tracy). The next one down was called Thomas (Thomas II). For him, Thomas I bought a 30 acre smallholding lying just to the north of Pockford, which in the course of time became known as Little Pockford. Thomas II duly moved in, got married (marriage record lost), and had a son (baptism record lost; birth I guess in the 1640s) whom he inevitably named Thomas (Thomas III). When Thomas II died in 1692, Thomas III inherited. In the fullness of time Thomas IV moved into Little Pockford, married and had a son whom he named – you’ve guessed it! – Thomas. But now came a rather tragic snag. The boy died in infancy. And then two more tragic snags, in the shape of two more sons, both also named Thomas, who both also died in infancy. Thomas IV’s next three children were all girls – the Mary, Elizabeth and Ann (of whom Ann became Tracy’s ancestor). Then Thomas had another son and, doubtless hoping for a change of luck, christened him William. This stratagem did not work: William died in infancy too. However all three girls survived into adulthood. Which is rather strange. I cannot help feeling that Thomas IV’s wife Mary was a carrier of one of those diseases like haemophilia which does not affect females but is fatal to males. Whatever the explanation, I know of no other instance where Enticknap parents had several boys and girls with all the boys dying in infancy and all the girls surviving to adulthood. To round off this saga, Thomas IV died in 1780, and Little Pockford then passed to his eldest daughter, Mary, who was by now married to a wood hewer named Richard TURNER. I believe however the estate was managed by the Pockford family for another 30 years or so, until Richard & Mary themselves died, when it descended to their sons and thus fell out of the Enticknap story. Ann NASH, incidentally, continued to live in Chiddingfold throughout her long life, so will have witnessed the decline and fall of the Pockford estate at close quarters. Wow! There’s a LOT of information there but love the way you have explained the story. Very entertaining :) A perfect ending to Tracy’s story book… (when I get there!) I had the same thought as you about Ann’s family losing all the boys. Thank you so much for all the info and your help. I too am an Enticknap, and originally from Surrey. My Grandfather lived in Wimbledon, but I don’t know if that’s where he started. Anyway it is interesting that so many Enticknaps seem to have the same locale in common. My question is, do you have any knowledge of the Enticknap’s connection to the battle of Agincourt? It’s been a popular legend in our family for years, but sadly I can’t find any evidence for this other than for a newspaper article I once read but no longer have a copy of! Frustrating. Online searches are proving fruitless…. And I lived from birth until age 18 in Hartfield Road – only 15 minutes’ walk away! I have only just seen your reply to this. That is incredible that your father knew my grandfather.. I shall tell my father! Were they related in any way, or did they just have the name in common? ..And yes, sadly Eric died a few years back. I have actually just recently taken up archery myself, deciding to follow in our ancestors’ footsteps.. I wonder if I will ever be an “archer of ye best sorte”?! I am also an Enticknap and was born in Wandsworth in 1936, the son of Robert Arthur and Doris (nee Elmes) Enticknap. I have 5 siblings, Peter, Carol, Rodger, Michael and David. I, like Eric, lived in Gap Road, Wimbledon from 1980 until I emigrated to South Africa in 2004. My fathers siblings, as far as I can remember, were Alfred, Richard, Margery, Dolly and Jack, Jack’s son Graham worked for Wandsworth Borough Council in the 80s.. My grandfather, who first name I cannot recall, lived in Cambourne Road, Southfields. I have been in constant contact with Mark Enticknap who I discovered in South Africa back in 1996 and who now lives in Newbury. His family originated in Hazelmere, Surrey. In South Africa there are to my knowledge several Enticknaps, including Mark’s father and possibly his brother. On a visit to Seattle, USA back in about 1989 I made contact with a Joan Enticknap. She later supplied me with a lot of information about the Enticknaps and sent me newspaper clippings about the family and their roots being in Surrey in the Guildford area. She also told me that there were Enticknaps over the border in Vancouver. I would be interested to know if anybody has any information about my branch of the family, particularly those from the Wimbledon/Wandsworth area. Your grandfather was George William ENTICKNAP (1867-1930). I cannot identify the Mark ENTICKNAP mentioned, so cannot tell if there is any relationship between them. I have corresponded with Joan ENTICKNAP of Seattle; she is related to us. Her grandfather Herbert ENTICKNAP emigrated to the US early in the 20th century; he was born in Witley in 1877, the son of a blacksmith (William), and also the grandson of one (John). John was the brother of our ancestor William and David ENTICKNAP above’s ancestor Henry; all three were the sons of William and Elizabeth nee DENYER. Hi Nicholas, I have just received an email from Mark Enticknap who I mentioned in my post to you last September. It concerns Commander Ken Enticknap RN (retired) who served in the Royal Navy during the Falklands conflict. I wondered if you know of him and where he fits in to the family.You can read a little more about him in the following link. My parents moved to Bognor Regis back in 1965 when I was seven and lived there for the rest of their lives. I still have a brother and nephews and nieces who live there. I moved away and settled in Cranleigh near Dunsfold first then Milland near Liphook before moving out to Australia. I have had contact with a member of Stephen’s family too, the sister of his grandfather Bill (1895-1960). Bill was invalided out of World War I with the loss of an arm, so I guess he was one of the lucky ones. Bill’s father was John, a shepherd. Our surname is not Norse and did not come over with the Vikings. Hi Leo, very interesting reading. We have lived in Australia for the last 12 years near Brisbane although we are back in the UK for a couple of years. One of our sons is still in Australia. My father was born in Wandsworth, London but spent most of his childhood in Brighton, West Sussex. I was under the impression that Enticknap was originally a Norse name and came over with the Vikings, but I don’t know how I got to here about that and can’t find anything to connect the name to Norse. It’s surprising how, still, almost every Enticknap you meet has a direct connection to that little patch of south-east England, within one generation at most. I spent my entire childhood in Wimbledon, only leaving the area when I went to university. My father still lives in the area, and his father was born and brought up in Woking. Out of a sheer coincidence, my wife (an American, but whose mother is originally English) has relatives who live in Alton and Bognor Regis. When we visited them together for the first time, they recognised my surname instantly and weren’t the slightest bit phased by it: that patch around the Surrey/Hampshire/West Sussex borders is still very much Enticknap country, with the name in evidence all over the place on shop fronts, business names, churchyards and so on. This site was created using WordPress and the Cazuela theme. Its content is © Leo Enticknap, 2014 except where otherwise indicated.